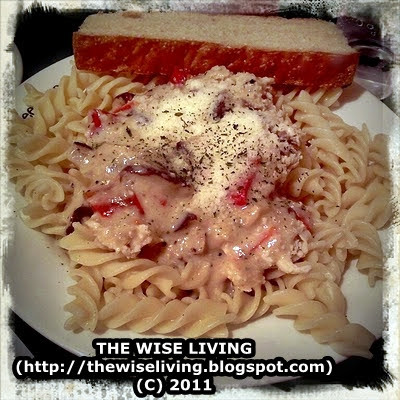 Today, we'll talk about Coffee Bean and Tea Leaf's heavenly Roast Chicken and Mushroom Fusilli. Why? Because it's raining - and because we can. I think that it was such an ironic happening that the minute I was able to post my thoughts regarding Emergency and Blackout Preparation, a blackout did happen. And so for 11 am of September 27 until right now, 12 pm of September 28, we have no electricity at our home. I love it here at Coffee Bean and Tea Leaf! We are enjoying ourselves here and we are not pressured to buy lots of foods and the like. My mom and I planned to stay for a long time so we bought one Regular Green Tea Latte, one Regular Chai Tea Latte and one Roast Chicken and Mushroom Fusilli. It is a good thing that I was able to purchase a Swirl card last September 26. Why? Because right now, I am using the free wi-fi here at CBTL Bonifacio High Street with my mother. We initially went here to be able to charge our gadgets. I hated having nothing to do while a blackout is happening. And so because the weather has finally improved a bit, we went here. The Roast Chicken and Mushroom Fusilli was awesome, really. I love the creamy yet unbelievably light flavor of the sauce. The sweet red pepper complemented the overall taste of the dish. The fusilli was al dente and I think that I would continue craving for it. Have you tried CBTL's yummy pasta yet?